Cold winter mornings on the farm meant a hearty breakfast before heading out to feed the pigs and cows and work the fields. My grandmother would rise before dawn and fix eggs, bacon or sausage, maybe grits and almost everyday—biscuits. 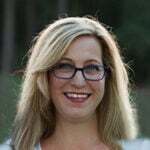 She kept the wooden biscuit tray underneath the counter, adding more flour when needed. The tray was covered with a towel and showed the nicks and crannies in its surface from years of use. Though I watched my grandmother and my mother, who makes the same biscuits, many times as they added shortening, poured in buttermilk, then rolled the biscuits in their hands to place them on the pan, it took years of practice before I could perfect the method myself. And I still have to actually measure the ingredients, as I haven’t perfected the “just add it until it looks right” method. I have learned the feel of the dough, however, and this, I believe, is what comes from years of practice. You just know when the dough feels right. You know when it’s too sticky and you need to add more flour, or you know when it’s too dry and you need to add more buttermilk. The practicing is worth it—once you get it right, you can produce light, tender biscuits in minutes which taste so much better than anything from a can or freezer. Note: I only use White Lily flour for biscuits. Usually all-purpose, but if you don’t have it then self-rising works just fine. If you use self-rising, skip the baking powder and salt as it’s already included. Preheat oven to 500°. I don’t grease the pan, but you can if you want. In a large bowl, stir together flour, baking powder and salt. Cut the butter into small pieces and mix in using your hands or a pastry blender. You want the flour and butter to become crumbly and well-mixed but still have some chunky pieces of butter that you can feel. Make a well in the middle of your flour and add the milk, a little at a time, using a fork to incorporate flour from the sides of the bowl. Mix the milk until the flour is all incorporated and you have sticky dough. Then you’ll sprinkle a little more flour until you can handle the dough without it sticking to your fingers. If the dough appears too dry and crumbly then you probably need to pour in a little more buttermilk. Knead very gently a few times by folding the dough into itself from side to side. The more you work the dough, the more likely your biscuits will turn out like hockey pucks. When the dough is ready, it will be smooth and slightly moist and not as sticky. Pick up a handful of dough and roll slightly and place on pan, then flatten a bit until it’s almost an inch high. 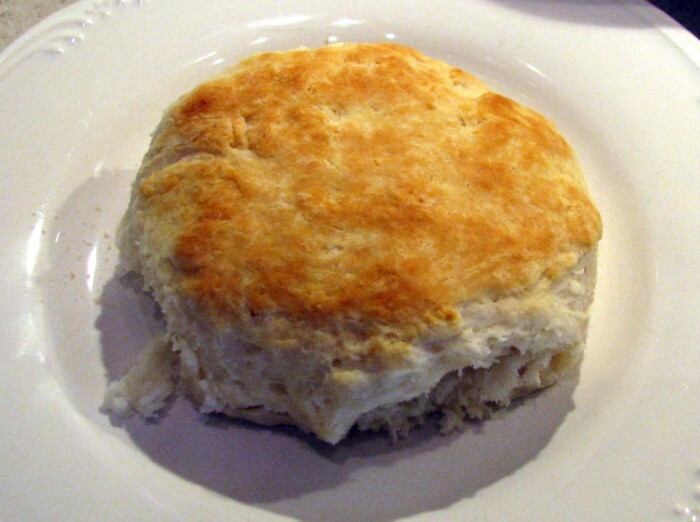 This will give you large, fluffy biscuits. You can also roll them out and use a biscuit cutter but that seems like too much trouble to me. Place the biscuits on the pan touching each other. If not baking immediately then refrigerate your biscuits because the butter needs to stay nice and cold. I usually get everything else done and bake the biscuits last, so they are hot as soon as we sit down at the table. Bake 10-12 minutes until golden brown. Now, grab some butter and jam and see if you can eat just one. Soft, fluffy, homemade buttermilk biscuits are good for breakfast, lunch, or dinner. 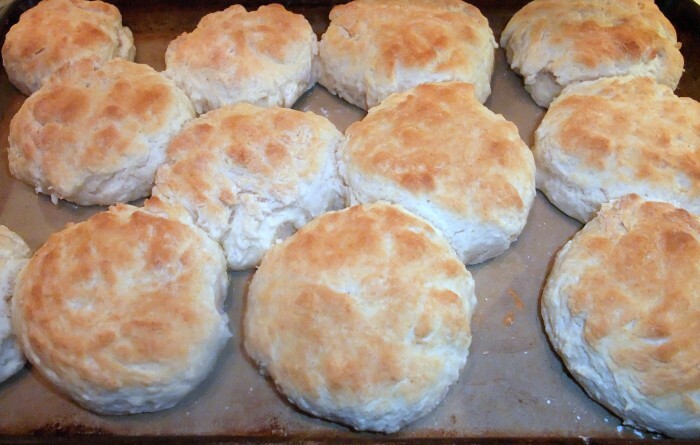 Fill these biscuits with country ham or sausage for a great meal. Preheat oven to 500°. In large bowl, stir together flour, baking powder, and salt. Cut the butter in small pieces and mix in using your hands or a pastry blender. Make a well in the middle of your flour and add the milk, a little at a time, using a fork to incorporate flour from the sides of the well. 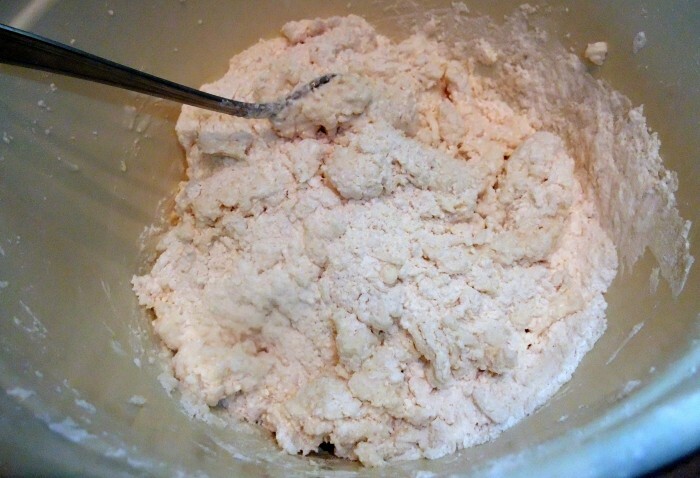 Mix the milk until the flour is all incorporated and you have sticky dough. 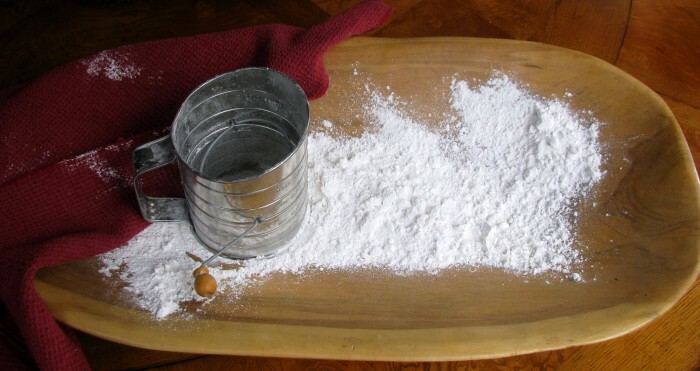 Then you will sprinkle a little more flour until you can handle the dough without it sticking to your fingers. If the dough appears too dry and crumbly then you probably need to pour in a little more milk. Knead very gently by folding the dough into itself a few times. 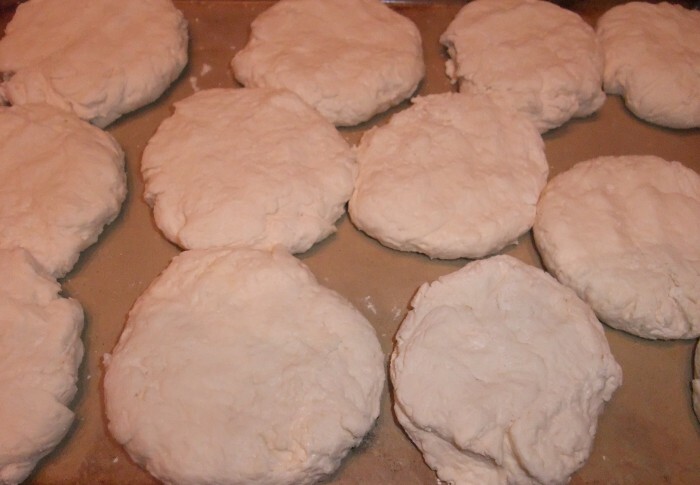 Pick up a large handful of dough and roll slightly and place on pan, then flatten a bit until it’s about an inch high. Place the biscuits on the pan just touching each other. Bake 10-12 minutes until golden brown. Tips: If your biscuits are too hard or touch, then you probably worked your flour too much or didn’t add enough milk. Practice and don’t give up. It takes a while to get the feel of “just right” dough. My husband makes buttermilk biscuits nearly every weekend! Nothing beats them. Yours look great. Thanks, Molly. Lucky you! My husband probably wouldn’t even know how to open a can of biscuits, much less make from scratch. But he does clean, so it all works out. Thanks, Sheila. That picture is of my great-grandparents, not sure of the date. Good luck with the biscuits — and don’t give up if they don’t turn out great the first time. It really does take practice.